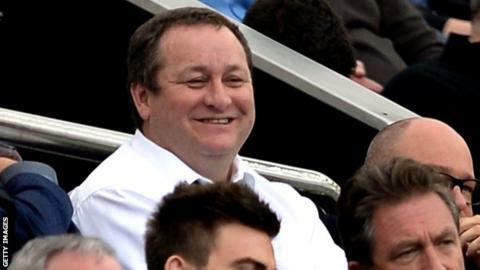 Rangers are to borrow £10m from Mike Ashley's Sports Direct retail company to stay in business. While £5m will be available as immediate working capital, it will also be used to repay a £3m loan made by the Newcastle United owner last year. In return, Ashley gets security over the Scottish Championship club's Murray Park training ground, registered trademarks and other properties. But Ibrox Stadium is not included in the latest deal. The prospect of Ibrox being included led to protests from the club's fans. Rangers are also giving Ashley, for the duration of the loan, a further 26% of shares in Rangers Retail Limited, 49% of which was already owned by the English businessman. "It's just over 12 months since I became chairman and I had three goals. "One; to make sure this great club never goes into administration. "Two, to get some money into the club. There was no money when I arrived. This is a great deal and really moves us along in getting some decent money. "And three is all about the football. We've got to get this club into the Premiership and into the Champions League and this sort of money will really help." Any shirt sponsorship proceeds from 2017-18 will be for the benefit of RRL and the second £5m tranche of the loan will only be drawn down if required and only after due diligence by Sports Direct. The news came in a morning statement to the Stock Exchange on the day that the Scottish FA's judicial panel was expected to begin its hearing into whether Ashley was in contravention of its rules on dual interests in football clubs. Ashley, who already owns 8.92% of Rangers shares, was recently blocked by the SFA from increasing his stake to just under 30%. The SFA confirmed on Monday that the hearing would merely be "procedural" to allow the English businessman's lawyers more time to prepare their case. Rangers had received an alternative loan offer from a group of wealthy Rangers fans - Douglas Park, George Letham and George Taylor. However, the club said in a statement that: "The terms negotiated with Sports Direct represent the optimum combination of quantum and duration of funding, allowing the company time to arrange permanent capital which can be used for strengthening the playing squad." Rangers fans groups have been unhappy at the current board, with attendances falling this season despite two successive promotions. "The company's financial condition has been perilous for a number of months, exacerbated by lower than expected match attendances," Rangers added. "The directors have implemented a cost-cutting program with which they have made significant progress. "There is, however, an immediate need for a substantial injection of capital." In addition to security over Murray Park, Edmiston House and Albion Car Park, Sports Direct will also have the right to nominate two directors to Rangers' board for the duration of the loan. Following Ashley's previous loan, former Newcastle managing director Derek Llambias became Rangers' chief executive, while Sports Direct executive Barry Leach was appointed finance director, leading to former director and shareholder Dave King calling for a general meeting to replace the current board. Rangers chairman David Somers said: "The board has sought for some time to establish a long-term funding solution for the company in order to create a platform of stability to build for the future. "This facility begins this process and we very much hope that it will be augmented with further permanent capital in due course." The club added that Rangers Retail would declare a dividend of £1.6m before the new arrangement comes into place and that this this would be used by the club to repay money owed to Sports Direct.